My middle daughter, Maili, is expecting a baby in May and I asked her what she wanted me to make her and the little one. She said to make her whatever was in the box for Kate, her sister-in-law, and mother of those cute little twin girls. One main thing she liked was the rainbow blanket. It's a stroller blanket and is a free pattern on Lion Brand Yarns website. I also have to make burp cloths, receiving blankets, a quilt, change pads, sweaters and I guess whatever else I come across and have time for. My quilting buddy Judy and I get together a couple of times a year - she lives in a different city about an hour and a half away. We usually attend a quilt show or some other quilt related function. It is at these times that I have been known to suggest we do a challenge. It started with a black and white theme when we both bought some charm squares at the Creative Sewing and Needlework Festival many years ago. On the way home we came up with some 'rules' or guidelines. Judy, of course, finished her quilt way before I did. We are also still making paper-pieced North American animals and exchanging those. It's my turn and once again, I am behind. There is an African themed quilt that she has also completed but mine is just in the creating-in-my-head stage. I will get to it soon, I hope. 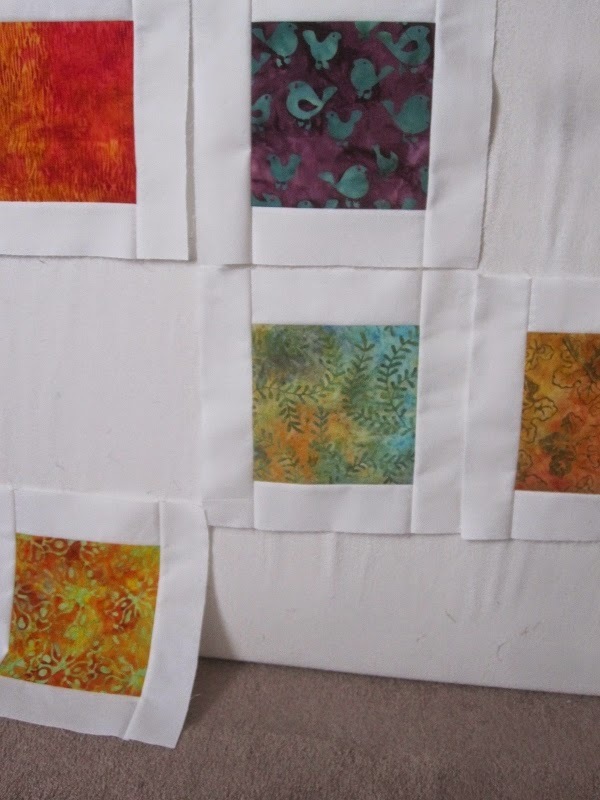 In the meantime, the last thing we decided on was to make a quilt together using batiks. Once again, when we attended the Creative Sewing and Needlework Festival (I know it goes by a different name but my mind is slow to change) and it was there that we found some batik fat quarters that were on sale. I had shown Judy the pattern that I thought we should do. I was thinking that Judy could stretch herself and enter the 'Modern Quilt' world - just a little. The pattern is Camille Roskelley's "Framed" from her book, Simply Retro. Judy thought at the time that it needed a border so we shall see what she comes up with. Here's the beginning of mine. We bought several batik fat quarters (10, I think), cut each of them in half and then added our own. The pattern calls for 25 squares. Judy was happy to comply since she said she had a collection of batiks but had never found the right project in which to use them. I'm sure Judy is finished her quilt by now. I haven't spoken to her since before Christmas. Her guild is having a quilt show in May and I think this was one of the quilts she wanted to finish to put into the show. Judy gets her quilts quilted by a long armer and I hand quilt so it will be a while before this one is finished by me. These five are some of my favourite fabrics. I had all of the 25 blocks set aside but I'm finding that I am revising my selection. Love your batiks! I still call it the Creative Sewing and Needlework Show too, so I know what you mean. 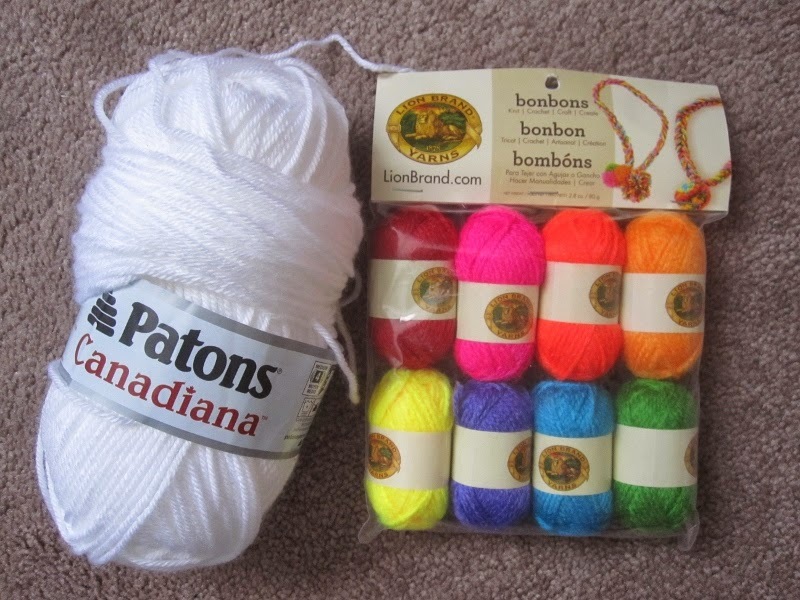 The colours of the Lion Brand yarn are so pretty! Maili's baby will be so blessed with goodies from you. The chosen wool is so lovely and bright. 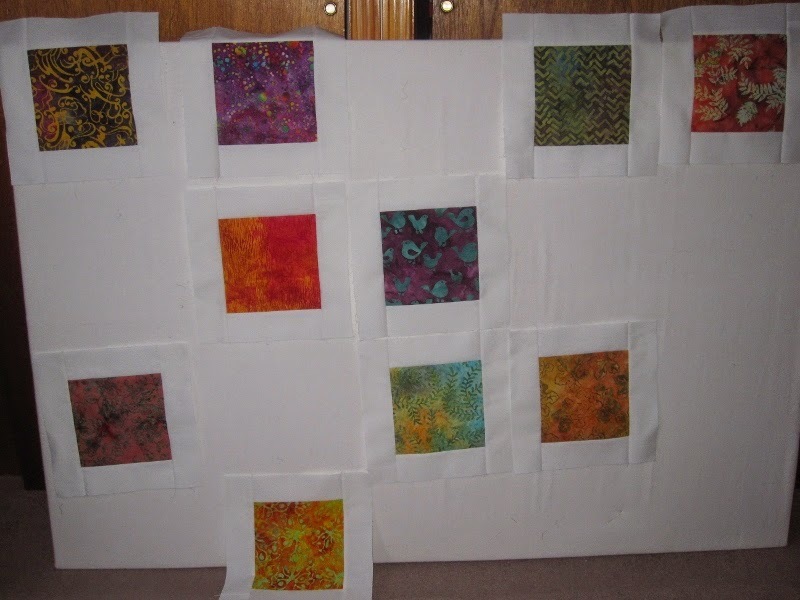 Having a friend who doesn't mind doing creative challenges must be so much fun.Have fun with your Batik fabric quilt. I loved seeing the snow in your header photo, another hot one here today 38 forecast. Batiks are my favourites, and a new baby, you have chosen bright and beautiful yarns for the little one, and a challenge with a friend, super idea. I think your batik quilt is going to be stunning. We all work at our own pace, finishing our art pieces when we can. Well you're sure going to be busy, lol!! Love the batik quilt idea.